Today’s excerpt is something fun! I wanted to share with you the first few pages of my script for Last Man Zombie Standing. Did you know that I’m a fan of Vincent Price? I feel the iconic actor really brought a lot to horror, and there’s a lot to be said for the beauty of black-and-white television. I wrote the script with a few easter eggs built in; writing it was a little challenging, in the sense that I had to communicate my vision not knowing the artist. I’ve never met Josie Pi Grant, but I think she did a brilliant job breathing life into the undead imagery I had in mind. 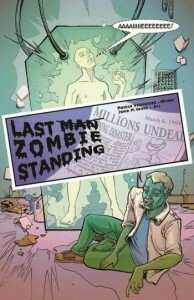 If you’re interested in this comic, you can pick up a copy of Last Man Zombie Standing on DriveThruComics.com. Or, you can pick up a copy of Unfashioned Creatures, A Frankenstein Anthology from Red Stylo Media’s website. Here’s the first page straight from my script! PANEL 1: The first image is a close-up of piles of newspapers lying on the edge of a lab table. The date is March 8, 1964. The headlines read: “U.S. Scientists Blamed For Outbreak.” “Millions Undead.” “Human Cloning A Disaster.” “Apocalypse Now!” Here, the title of the comic may be superimposed on the left hand side of the image in a gory, stylized font. PANEL 2: In this image, we see we’re inside a science lab; the room is in total disarray. Piles of books and newspapers are stacked haphazardly on the floor. Tubes hang down from the ceiling. There are lab benches piled high with bottles of different shapes and colors. The light source is directed toward the right corner. The windows have been boarded up. There are mousetraps scattered across the floor, ashtrays filled with cigarette butts, and empty bags of airport peanuts. Mary Tyler Moore and other models adorn the walls; their pictures have been ripped out of magazines and taped up for decoration. 1 Dr. Powell (off screen from right): Dare I? PANEL 3: We see DOCTOR POWELL leaning toward a coffin-shaped glass tube filled with an electric blue fluid. The tube sits at a 45 degree angle. Inside the propped tube, lies the body of Doctor Powell’s clone, 000138, but we can’t tell who the man is yet, just that he’s male. Doctor Powell is a tall, spindly man with high cheekbones, heavy brows, and a thin moustache. He is wearing a traditional white lab coat, shiny black shoes, and tweed pants. His clothes are worn and threadbare. A ballpoint pen hangs over his ear. His hair is graying at the temples and he looks malnourished. He still wears his beat up name tag and there is an old metal flashlight sticking out of his pocket. He also wears a broken watch. On his right hand, between the thumb and forefinger, is a series of digits: 000137. 2 Dr. Powell: Why, there’s no telling what the two of us could do. Build armies! Clone Eve! Find the cure! PANEL 4: Here, see a close up of “Dr. Powell” in the tank and our suspicions are confirmed: this clone is Dr. Powell. He is not as malnourished as the scientist is, and he is clean-shaven, but the resemblance is clear. Yes, I’m working on a COMIC! I’ve mentioned my desire to write more comics before; right now I have two floating around in my head. One is definitely a webcomic/comic; the other is a dark science fiction story that I’m adapting into a novella. (Partly, because the latter doesn’t have a home in a script format, and it’s the kind of tale that’s better as a screenplay/comic. I have a better chance of selling it in prose, actually.) I’ve also said, however, that writing comics requires something else — an artist, letterer, inker, etc. The creating good art part of my brain has long since fallen into disrepair; art direction is no problem for me, mind, but all those skills associated with drawing and graphic design are now rudimentary at best. I make stick figures cry. Enter my friend Mark Stegbauer. Mark volunteered to partner with me, and I’m giving him a co-creator share. I may be bubbly about this comic and whatnot, but as I’ve explained to Mark, I’d prefer not to make any announcements until we’ve got content down. The business side of the equation is sorted, but with comics? If the creative aspect isn’t done and we’re not ahead of the game? No point in getting folks excited — even if it’s ONE fan — and have nothing to show for it. Not cool. Yes, that is a more conservative tack. Especially since everybody’s aggressive about announcements and whatnot. Thinking long-term, as a newbie coming into the field, however, I’d prefer to take the freelancer’s approach and do-as-I-say rather than say-and-maybe-do. After all, this is my original work and my paying projects do take precedence. Right now, this is a hobby that I hope will turn into something way cool. Either way — EXCITING! Be sure to check out Mark’s website: steg-art.com. Wooo-hoooo! Mood: I [F-bomb’ing] hate moving. Work-Out Minutes Logged Yesterday: I went for a walk. Movie Last Viewed: Captain America: the Winter Soldier. 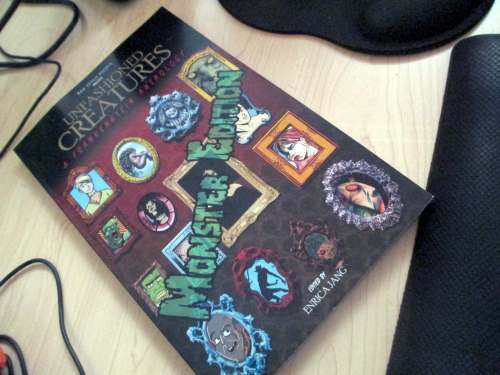 Over at Red Stylo Media, you can get the Monster Edition of UNFASHIONED CREATURES along with two other literary-based graphic novels POE TWISTED and SHAKESPEARE SHAKEN for $50. Here’s a link to the monster bundle. Enjoy! My first comic Last Man Zombie Standing is included in both the monster edition and standard edition. You can get your hands on a digital copy now and see a preview through DriveThruComics.com and Red Stylo Media. The print editions of both will be available early 2014.